Islamist protesters stormed the U.S. Embassy in Egypt’s capital Tuesday, destroyed the American flag, and replaced it with a black Islamist flag to protest a U.S.-produced film depicting the Prophet Muhammad. Get that? They destroyed the U.S. flag and replaced it with a flag similar to the one used by Al-Qaeda — all on the 11th anniversary of the 9/11 terrorist attacks. So, on the 11th anniversary of 9/11, rioting Egyptians stormed the American embassy, destroyed our flag, and hoisted the Islamist flag — and the U.S. embassy apologizes for hurting their feelings? If this shocks you, you are not alone. Many Americans expressed their outrage on Twitter and other social mediums. Conservative columnist Charles Krauthammer was also disgusted by the embassy’s response. These days, most commentary on the Declaration of Independence focuses on the implications of the passage that “all men are created equal [and] that they are endowed by their Creator with certain unalienable rights.” Dwelling on that passage might surprise Thomas Jefferson, who thought it was self-evident. The argument that flowed from his premises is more important, namely that governments derive their just powers from the consent of the governed, and when the relationship shifts to the point where government becomes a threat to the lives, liberties and pursuit of happiness of the people, it is government – not the people – that must change. The list of grievances in the Declaration – the part people often skip over – is critical to the argument because those grievances serve as evidence to make the case that British government had by its actions sundered the fundamental relationship between Parliament and the American colonists. Such a catalog of “abuses and usurpations” today might include: imposing confiscatory levels of overall taxation; using budget authority to transfer billions of taxpayer dollars to government insiders and pet causes; running up the national debt to a point where it is nearly equal to the nation’s total productive output; saddling current and future generations with ruinous debt to pay for pet programs that benefit the few at the expense of the many; failing to secure the nation’s borders from a flood of illegal immigrants and standing in the way of states and localities seeking to take up this fundamental duty, which the national government has chosen to ignore; and a variety of other issues ranging from a sketchy national census to crumbling national security. The prime difference between the situation in 2010 and that of 1776 is that the people now can provide oversight through the election process. The ballot is the corrective mechanism that was unavailable to the Founders. Today’s dire situation in Washington has approached the intolerable because too few have gone to the polls to defend their rights against the predatory, permanent governing class in Congress. An electorate that fails to defend its rights deserves what it gets. Rights guarantee nothing unless they are used, and if they are not exercised, they tend to be exorcised. After independence, Jefferson explained that the Declaration was “an expression of the American mind” intended to “give to that expression the proper tone and spirit called for by the occasion.” The result is a timeless document the spirit of which is as applicable today as it was then. The people have the means at their disposal to take back our country and the government from the disconnected oligarchy in Washington. However, this only works if Americans actually step up. To paraphrase Benjamin Franklin, the country will only be a republic if the people are strong enough to keep it. Three California high school students are fighting for their right to show their American patriotism — even on a Mexican holiday — after they were forced to remove their American flag T-shirts on Cinco de Mayo. The three were among a group of teenage boys who were told by a school administrator that they had to remove their patriotic clothing or leave the school because other students were celebrating the May 5 Mexican holiday, raising fears of fighting. The school district later reversed the administrator’s decision, but on Wednesday, the three students and their parents filed a lawsuit against the Morgan Hill Unified School District and the principal and assistant principal. Superintendent Wesley Smith would not comment on the lawsuit, saying the district has not received official notification. In May, Smith called the incident “extremely unfortunate” and said the school administrator had apologized. The teens were sitting at a table outside Live Oak High School when the assistant principal asked two of them to remove their American flag bandannas. The boys complied, but then were escorted the principal’s office, where they were told they must turn their T-shirts inside-out or be sent home. The assistant principal told the students he did not want any fights to break out between Mexican-American students celebrating their heritage and those wearing American flags. 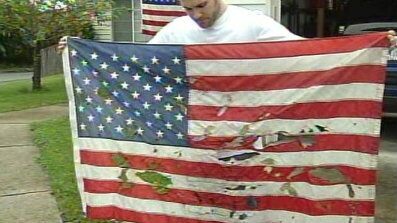 A Wisconsin Army veteran — who faced eviction this week for flying the American flag — will now be allowed to keep the flag up for as long as he wants. Under mounting nationwide protest, Charlie Price, 28, of Oshkosh, Wis., and officials at Midwest Realty Management struck a “mutual agreement” that allows the veteran to continue displaying the patriotic symbol, according to a statement posted on the company’s website on Thursday. Price and his wife, Dawn, 27, were previously told they had to remove the flag — which hangs in a window inside the couple’s apartment — by Saturday or face eviction due to a company policy that bans the display of flags, banners and political or religious materials. Randy Rich, the apartment complex’s property manager, told FoxNews.com that Midwest Realty Management received nearly 4,000 e-mails and thousands of phone calls in connection to the controversy. Rich said a Facebook page created by Dawn Price contained personal information of some employees at the apartment complex that led to harassing messages. The company has asked her to remove that information since it “has no bearing on this situation or her goal of changing the current flag legislation,” Rich’s e-mail continued. A Facebook group created by Dawn Price, “Freedom to Display the American Flag,” had roughly 2,000 members on Wednesday. As of early Friday, that number had grown to more than 44,000. Price, who served tours of duty as a combat engineer in Iraq and Kosovo from 2000 to 2008, said he’ll now work on amending the federal Freedom to Display the American Flag Act of 2005, which states no “condominium association, cooperative association, or residential real estate management association” may stop someone from flying the American flag. The law, however, does not apply to renters. In a statement posted on its website on Thursday, Midwest Realty Management apologized to Price and all U.S. veterans. “It was never our intention to hurt the Prices or disrespect what Mr. Price and all veterans have sacrificed for each and every one of us,” the statement reads. 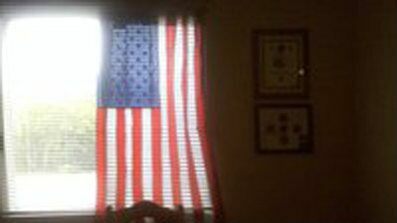 The company will now revise its policy to allow residents to “honor America” and display the flag in a manner similar to the Prices, who have hung the symbol in their apartment since Veterans Day. Price’s wife, Dawn, told FoxNews.com earlier this week that she began decorating their apartment last year to honor his eight years of service. An American flag topped off the display, she said. Veterans’ groups were furious at the realtors’ initial refusal to allow the flag to fly. Charlie Price said he wanted to thank everyone who contacted him and his wife since the controversy began last week when they were told they had to remove the flag or face eviction.